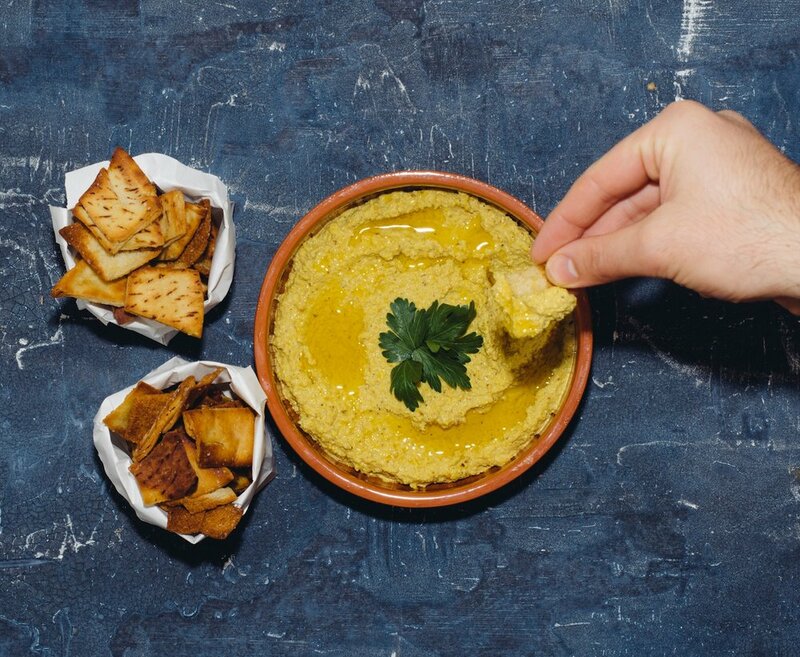 My clients recently have been asking a lot about Whole30 friendly menu, so I’ve been thinking about how to recreate creamy, hummus-like dips without using chickpeas. Since those who are following Whole30 diet can’t eat chickpeas, I substituted them with roasted cauliflower for creamy base. It’s also easy to buy pita chips, but if you can make them from scratch, they are incredible. All you need are leftover pita bread, salt, and EVOO. I highly recommend making homemade pita chips if you can because they are THE BEST. 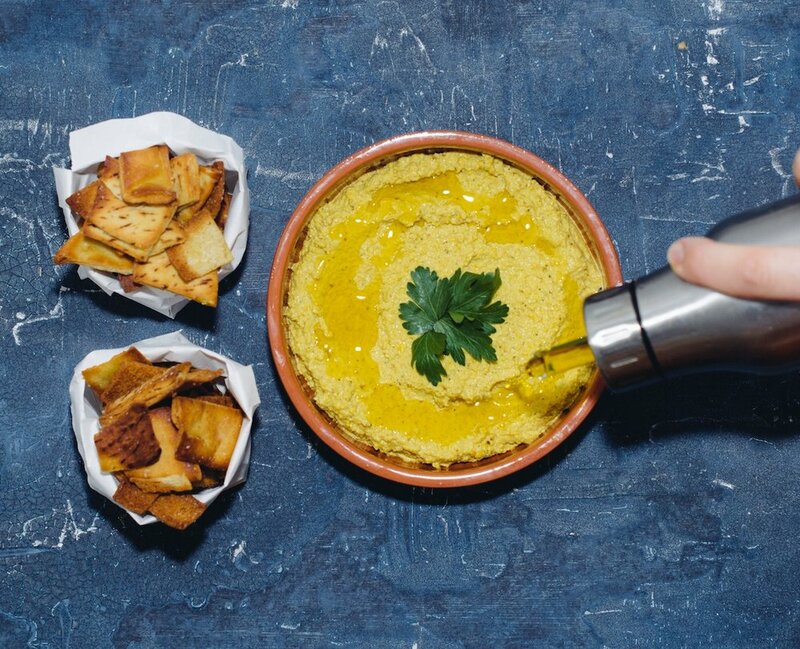 The turmeric in the dip not only gives a gorgeous golden color but also adds extra flavor to the dip. When you are dipping pita chips or fresh vegetable crudités, this dip will satisfy all of your cravings. Toss the cauliflower with ground ginger, garlic, 1 lemon (zested and squeezed), turmeric, and salt. Bake them on a sheet tray for 15- 20 minutes, or until the cauliflower gets tender. 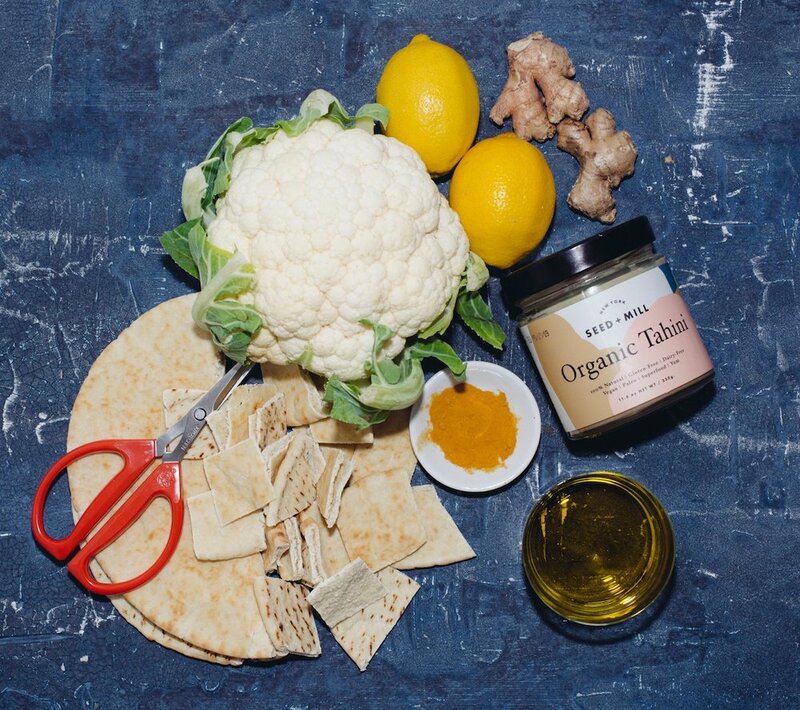 While the cauliflower is baking, toss pita bread with salt and 1 tbsp of EVOO. Feel free to add any seasonings you like, such as Za’atar, sumac, or oregano. Have fun with your seasonings. Bake the pita bread for 6-7 minutes, until they get crispy. Make sure you keep an eye on them because they get dark real fast. Once they are done roasting, take them out and let them cool. After the cauliflower is done roasting, put it in a food processor with tahini, 1 lemon (juiced), and the rest of EVOO. While the food processor is running, add an ice cube and cold water. They will help everything come together. Serve with pita chips. Enjoy!